Rotting Flesh Factor in Harlingen. HARLINGEN —Halloween daredevils from across the Valley have been lining up to test their courage. And to make sure everyone gets scared, gruesome rooms and more zombies, demons and others are waiting in the dark around every corner. Don’t forget to be trapped in one of the escape rooms and find your way out. 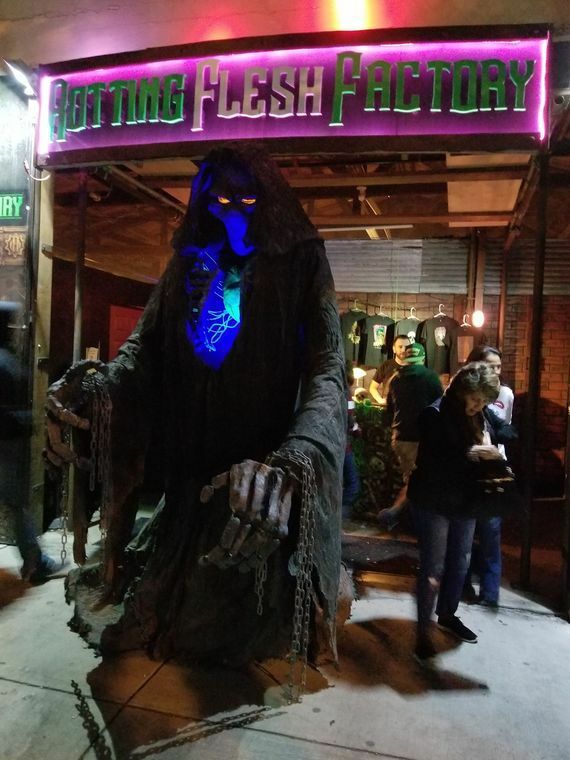 “You’re locked inside a room and you have five minutes to crack codes, solve clues and answer riddles to find the missing key in order to escape the room,” said Eric Fantich, Rotting Flesh Factory manager. But tonight is the last chance to walk through these dark, blood-spattered rooms filled with demons, zombies and scary ghouls. A couple nights ago, people were impressed with the haunted house. “It was pretty scary; there was a lot of frightening things popping out at of the dark that you woudn’t think was there,” said Paul Perez, of Donna, who attended Sunday with his family. Perez’s wife Kimberly didn’t shy away from saying she gripped herself to Paul to hide from the monsters as they traversed the maze of horror for the first time. “It was the best haunted house I have ever been to,” Perez said. The Rotting Flesh Factory is 15,000 square feet with more than 35 rooms of terror. The Rotting Flesh Factory has been open during the Halloween season since 2003. Fredrick Jaramillo, 13, from Lopezville said he was curious and wanted to experience the Rotting Flesh Factory for himself.